You've got questions! PreCentral.net has answer! Below, we go question by question from our gigantic Pre Forum Questions thread from the TreoCentral Pre Forum. This is Part 2 of 3. Don't miss Part 1 of our Palm Pre Answers and Part 3 as well! The Palm Pre should fully support MMS. I'm assuming that for the first time (for Palm/Sprint) it's possible to use data while on a call due to EVDO Rev A? Doesn't this already happen with the EVDO RevA Windows Mobile devices on Sprint? Since the Pre is capable of real multi-taksing, I expect this will be the case. ..I'd like to echo the question...Will there be a limit on the number of text message recipients (like the 10 for the POS Treos)? If not, will there be a good way to build a long To list from your contacts list without having to go back and forth once for each contact you want to add? I wasn't able to get too deeply into the messaging client, but it is an open question. Palm took their threaded text to the 'next level' by threading it along with Instant Messaging, but I'm not sure what will happen if you want to compose to multiple people. My hope and assumption is that yes, it will work. But I don't know. Assuming that there are units being used by people as 'their' phone, what is a ballpark figure for data useage per day/month for the phone when used in this web-centric way. Great question -- no idea. However, my hunch is that the phone will require the Simply Everything plan from Sprint, so data usage shouldn't be a cost issue. Who is the ODM for the Palm Pre ? Nobody's really sure yet that I'm aware of. My hunch is that it's Compal. ...but when a palm pre for Europe??? besides Europe - what about more general worldwide release plans. I believe that they're expecting this will also be the first half of 2009. As for the rest of the world, if I had to guess I'd say that Palm will manage to get Vodafone on board despite their stated goal of limiting what Operating Systems they'll accept on their network -- it does run Linux, after all. I saw that it supported direct push mail, but will it also sync Contacts and calendar? Possibly tasks? Some devices like the instint say they support exchange, but limited mail download and no contacts and calendar. Can the emal app read .eml attachments properly? Can the email app search the users mailbox like the Pocket Outlook? (That's probabbly asking too much). If it can really support exchange I'm there. Exchange support should be full and comprehensive. I'm basing that off the fact that the Universal Search is able to search through your corporate database in addition to your local contacts list. As for email search, well, I'm less sure about that and I suspect it's not going to be there. That is one of my favorite features of Windows Mobile, so I'll miss it too. Is there going to be a Pre emulator such as was done with earlier Palm OS. That way people could try out the new OS and maybe try creating some apps for the new system. If not haw about a Demo? Yes, from recent posts it appears that's how development works right now -- through a browser, actually. Will the one button "press and hold" feature to launch calls from the keyboard in POS carry over. That was one of themost useful things ever - 30 memory keys was so nice. I don't rightly know, but honestly, we're finally getting a smartphone with Universal Search, let's not get greedy. Ok, I kid, it is a great feature, I hope they're able to bake it in. Does the phone support video camera recording and will the final release product have a native Video recording program? Why no WMA support in the native audio player. What about audio/internet radio streaming, will that be supported? I can't answer the first questions there, but Pandora has created an app, so internet radio is definitely supported. 1)Is the mechanism on the bottom of the screen... is it a trackball? if so does it click in? Or is it more of a "joy stick" or a 5 way nav? 2)Does it support MP3 ringtones? Besides the question thats been asked about syncing PIMs how would you get photos and songs over if theres no desktop app? USB Mass Storage mode -- it just looks like a disk. What is the function of that silver button in the gesture area? Do all gestures need to swipe over that to be recognized? At first I thought this was a trackball like on a Blackberry or G1 but I haven't seen any indication that it functions that way at all. It will be strange not being able to have the fine tap control of a resistive touchscreen and stylus. I've never used a capacitive screen. Do you just use multi-touch zooming to be able to select small things where we used to squint and tap? Well, Palm has made sure that the widgets on the screen will be big enough to be tappable. For web pages, you just need to zoom in until the link you want to hit is big enough. It sounds like a hassle, but in practice it works very well -- and in my opinion is far superior to a stylus. 1. Do they need device beta testers? 2. If so, how can I become one? Is there a "soft" keyboard or plans for one? I don't believe there will be, no. I don't know, no. I pretty much have to assume that stuff like the Video Player are not just web-based tech, but Palm wasn't about to give us a list. What is the difference between the two USB ports? There is only one USB port -- the MicroUSB used for charging and data. Does it have voice recog? IOW can I voice to text or voice to dial? Not there out of the box, but there are a few different pieces of software that will sync up iTunes to any mass storage device in a way not too dissimilar from your iPod. We'll come back with a How To article on getting that done in the near future. Some of the demo units look shiny front and back while others have what looks to be a shiny front and a dull rubberized surface on the back. (See the Massive hands-on video for an example of each.) Shiny looks nice and high tech until you use it then it gets smeared with fingerprints and scarred with fine scratches. 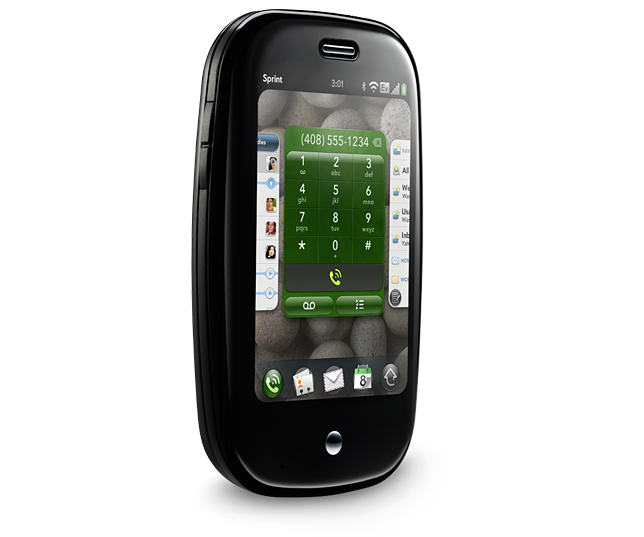 A rubberized finish is much more durable in the real world and makes the phone feel secure when using it single handed. 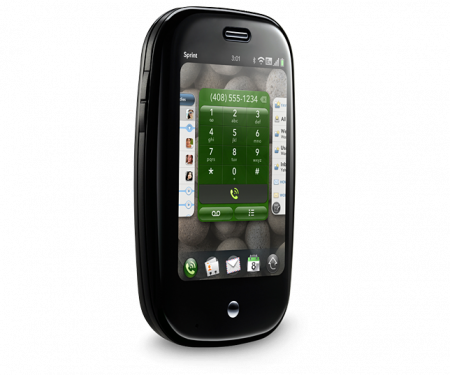 Will the production version have a shiny back or rubberized like my Treo 755p? Dieter great work! You and Mike are extremely lucky! Will the Pre have Google Earth or just Google Maps and if it's GM will it have Street View? Lastly, what file format does the video player accept/use? Hopefully MP4. I've got several iPhone movies that I hope I won't have to reconvert. They never showed Google Earth / Street View, but given that Google has updated their mobile maps client for Windows Mobile, BlackBerry, Android, and the iPhone pretty darn consistently, I wouldn't worry about the Pre. I can't speak too directly to the video player because it wasn't fully baked yet, but MP4 (non-DRM, of course) shouldn't be a problem. How does one open the battery door? Is it similar to the Centro? Actually, they weren't too keen on my trying to open the battery door myself. :D It looked to me like there was a tiny latch on the bottom. Is there a beam feature? Will bluetooth replace beaming? Perhaps it doesn't even make sense to link phones directly now that they are all web enabled anyway. Nope, no IR. As for Bluetooth beaming, they did tout that it had more Bluetooth features than Android or the iPhone (A2DP, specifically), but nobody mentioned beaming. That may be a feature that fell by the wayside. If it's not the standard used by the iPhone, BlackBerry, and the Treo Pro, I'd be shocked. I wonder if the Pre's hardware will support a phone recording application. I know my 700P did, where as my Touch Pro doesn't. From videos, application start-up time seems to be in the neighborhood of 4 seconds. Will that duration be targeted for reduction in the optimization efforts ahead? I can't speak to what Palm is targeting for launch times, but I suspect that 4 seconds is at least twice what they'd consider acceptable. Most of the apps I launched took 2 to 3 seconds, though I didn't have a stopwatch handy. I'm guessing things will speed up a bit when it goes into production. Any early developers on the scene? For example will we see a new "DateBook" released? We've heard rumors about a Gsm Pre. We've also heard that it will be Edge only. I don't think it will be EDGE only. Do the PIM apps all support categories and can they be color coded? Any thoughts on how well 'Getting Things Done' can be implemented on the Pre? It appears that different calendars from different sources are what get different sources, but I'm not sure about color coding within calendars. If you're syncing to Google, each 'category' is treated as a separate calendar.